Why nobody told me about kale crisps before? Seriously. I always struggle with eating veggies and my boyfriend doesn’t help as he rather asks questions like “do you want crisp/chocolate/cookie?” rather than “do you want healthy salad?”. I’m new to kale, somehow in Poland I’ve never encountered kale, well my Polish cookbook mention it, but we have never meet before. The first remembered meeting was at Joy the Baker blog, I read Joy’s blog for all the sweet, full of butter and sugar stories and girly stuff, but sometimes Joy gives you important life lessons, one of them was to try to balance your butter and sugar love with kale smoothies. Since than I was searching for kale. I bought it a few times and needed to explain myself to my boyfriend – why I bought this huge bag of green leaves. I tried to make a smoothie, but it didn’t work, my blender gave up and the smoothie was kind of chewy, you don’t want to have chewy smoothies. I will stay with spinach smoothies. I found the recipe for crispy parmesan and chilli kale crisps (or chips, up to you) in autumn Donna Hay Magazine. Actually there is whole section on kale and all recipes seems to be delicious (only tried 2 of them so far). So after keeping my kale for a few days in the fridge I decided to make these crisps and they are so delicious and easy to make and healthy and spicy and you can mix in any spices you want. 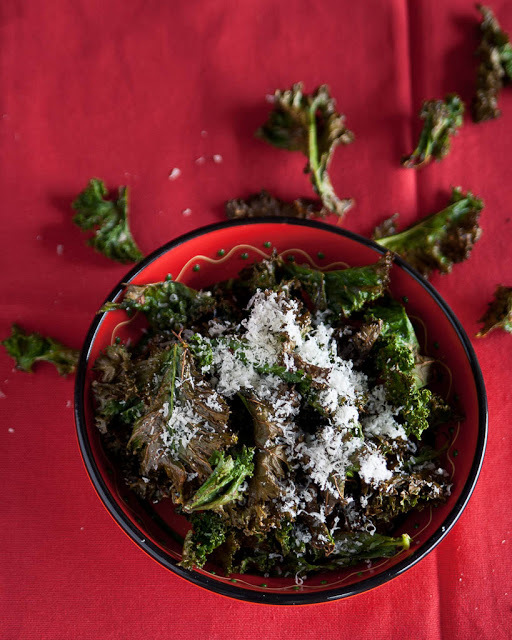 In a large bowl mix together kale, olive oil, chilli flakes, parmesan, salt and pepper. Mix well to combine. Place on a large baking pan and bake for 8-12 minutes or until crispy, you may do it in two batches. Allow to cool and sprinkle with extra parmesan to serve. Posted in Snacks and tagged chilli, kale, parmesan. Bookmark the permalink. Yes – they are the greatest thing – but I can’t always find kale so some times I still have to get a bag of nuts or crisps to feed my salt cravings – but I would much rather have the Kale crisps as they are SOOOO much tastier! I really love the idea of these. I am trying to eat a little healthier, before the Christmas binge, so I must try these out! I’ve never had kale crisps but they are appearing everywhere so I really must try them. Have you tried kale in colcannon yet? One of my favourite dishes, we had it at our wedding too as it’s a traditional Halloween dish.